With the Early Access release coming up early next year we try to step up our game and make a lot of progress each week. This week we have for you a complete rework of how Battle Brothers are generated and rendered. 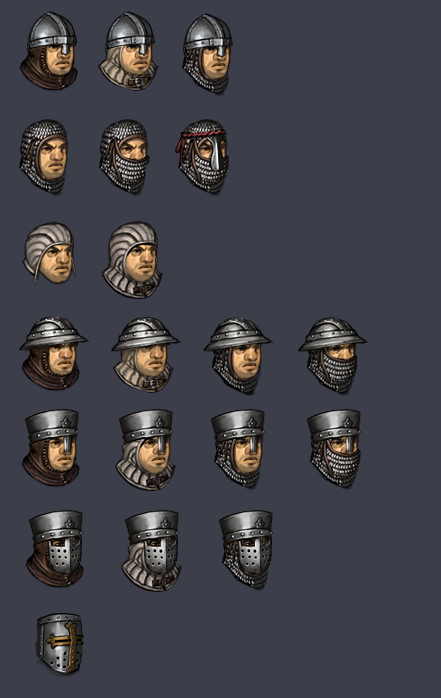 Get prepared for uniquely looking Battle Brothers with no less than 80,640 possible combinations for heads currently! As we now have hair and beard on separate layers, helmets no longer need to be extra large to cover all hair. This allows both for more creative hairstyles and also to decrease helmet size by roughly 10%, resulting in more realistic proportions. What is more, we also separated the armor from the bodies so that they also have a layer of their own and are rendered ontop of bodies. This makes it easier to show broken or damaged armor with parts missing and also allows Battle Brothers to have unique skin colors for more variety. A core mechanic in a game about mercenaries is hiring them, of course, which we just finished implementing. When approaching a village or city you can visit the local tavern and have a look at all the volunteers offering their swordarm for coin. Each volunteer comes with their own background, like being a farmhand or a retired soldier, a procedural background story, and their own equipment. Both the hiring fee and the daily wage they request depend heavily on the character’s background. A skilled and seasoned sellsword who brings a chainmail and sword with him will cost as much as 10 times or more compared to a sickly beggar with a club. We want you to make some tough decisions here when deciding which volunteer to hire. Would you rather hire a few well equipped and battle hardened fighters, or a wild bunch of cheap beggars, thiefs and outcasts with no combat experience? Like everywhere else in the game we don’t want to reveal more stats here than necessary. You won’t see any numbers besides the costs, but based on the background you’ll have a good idea of what to expect. Want a strong and sturdy Battle Brother? A farmhand or lumberjack is a good bet. Want someone good with ranged weapons? Try to hire a hunter. Need someone with combat experience? A sellsword or a retired soldier should do, although the latter might not have the stamina of a young man anymore. What is more, all characters come with traits, good and bad, which are also linked to backgrounds. Characters used to hard work are more likely to have the “strong” or “tough” traits, and while you won’t find any insecure adventurous nobles, they can be as brave as they can be cocky and overconfident. There is also a chance of characters having a title based on their traits, like an especially large and sturdy character being known as “the Mountain”, which should give you a hint. You’ll have to hire them to find out what hidden traits they have exactly. If you want to know more, you can read up on character backgrounds and traits in an earlier dev blog article. All in all, our goal is to have all the characters have a lot of, well, “character” despite them being randomly generated. Their unique looks, their background stories and their traits all come together for this. Some players won’t care about this, but if you don’t want a fisherman who strangled his wife to death in your band of mercenaries, you better take a close look at who it is that is applying to join you. What do you do with your freshly hired Battle Brothers? Get them some weapons for bashing in heads of course! 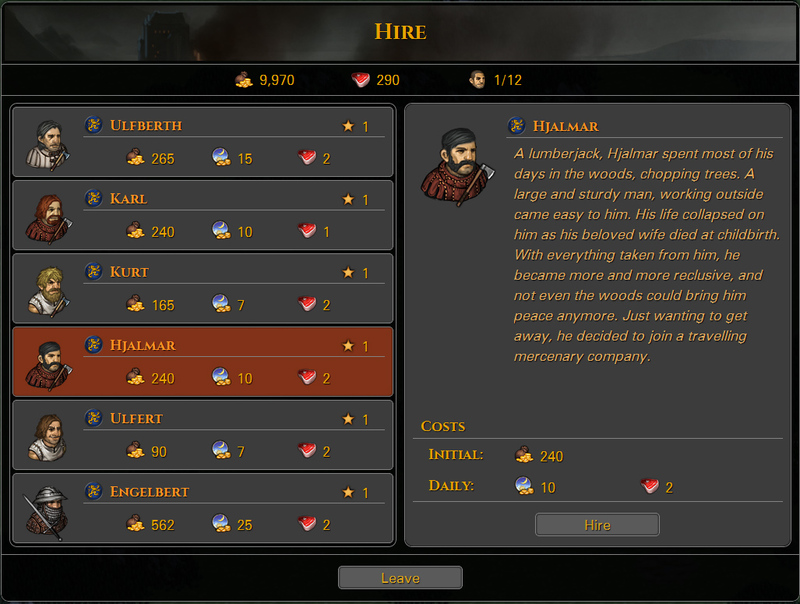 In villages and cities, but also in military locations like watchtowers and strongholds, you can spend your crowns on equipment like weapons and armor and also sell surplus equipment to fill up the piggybank. Shops have different equipment for sale depending on the wealth of the location and the type. A civilian village will sell different things than a military stronghold, and some pieces of weapons and amor will only be available in one of the two. The wealth of a location also determines the quality and quantity of available equipment, as well as its price. Villages that are bled dry from bandit raids and lost a lot of wealth will have little to offer you, whereas rich cities will have a great selection of equipment for you to purchase at kingly prices. If you make it your mission to protect a village for some time, even if the village isn’t able to reward you much at first, you can see it grow and stock up on better equipment. How early next year will early access be? You guys sound like everything is going very smoothly. The character backgrounds (Hjalmar’s background has a few mistakes in it) and appearances look awesome. Is there going to be a memorial or graveyard so you can see all your fallen brothers? I know you guys don’t have english as your first language. “As a lumberjack” instead of “A lumberjack”. …working outside came easily to him. Love the recruit system. Love the game. Keep up the hard. Took me a while to find this game but I have played the demo missions several times and love them all. I’m hoping that a demo version of the Orc line battle will be released. I am a huge fan of the strategy genre and would love to do anything I can as far as testing and providing feedback to help polish this gem of a game!! Any chance that the final release will be relatively easy to mod, so us obsessive fans we can tinker with fiddly little details like these? You will be glad to hear that we are reworking the armor values of all armor and helmets. At the moment the variations with the padded cloth, mail and reinforcements on the helmets are mostly cosmetic to add more variety. After the rework they will all have different and reasonable armor values – so we are on this! Regarding modding: We think the game would greatly profit from modding and is predetermined for it – unfortunately, we have very few resources and have to put it all into the EA development. However, we would love to have mod support for the final version! Hooray! I know getting the darn thing done is more important than modding, for sure. I hope you have time and money for that at the end, though. Just putting the game data in accessible, editable text files (XML?) would be a huge help. Another example of something I’d like to do with mods is remove hairstyles that don’t fit the theme in my eyes–e.g., dreadlocks aren’t what I expect in a medieval-Europe setting (but maybe I’m wrong? ); and the tonsure was worn strictly by monks to demonstrate that they were above such worldly concerns as “not looking like a doofus,” so it’s weird to see it with a carefully-groomed mustache. :) Just personal preferences, not something that I’d expect to be changed for the game proper. The Tonsur is actually worn by Monks in game. Each character has a randomly generated backstory where we describe what his former profession was and why he decided to become a mercenary. One of the Backgrounds is “Monk”. The dreadlocks are not a real haircut in this case but just what your hair would look like when you stop whashing and cutting it.